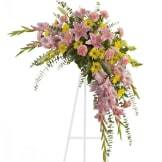 Rejoice with this softly dramatic cascade of pink and yellow blooms — lilies, gladioli and chrysanthemums — that has hints of eucalyptus and variegated greens. This elegant standing spray is a lovely way to honor the memory of someone close to you. 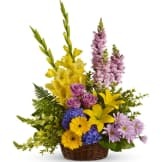 • Stems of flowers such as pink lilies, gladioli and carnations with yellow snapdragons, and daisy spray mums, accented by variegated greens and eucalyptus. • Arrangement measures approximately 38" W X 43" H.
Flowers will be received by a Tim Stewart Funeral Home's staff. This arrangement looked just like the picture. The colors were beautiful. Although I did not see the spray as I was not at the service, I got a report from the daughter of the deceased. She said it was beautiful and the personalized ribbon was a touching sight. This spray was absolutely gorgeous! 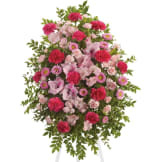 Since it was for my sister's wake which was being held out-of-town, it meant a lot to me that it was as beautiful as it was pictured/portrayed on The Sympathy Store's website. Many thanks to The Sympathy Store for making a difficult time less stressful. This arrangement cost less than the other one I ordered through the same place - for delivery to the same address on the same day. These flowers were simply stunning - the color combination was beautiful, the flowers were all very fresh, and the overall size was worth every penny. I would definitely recommend this arrangement.